Pieces, people. Working. Sometimes the right trophies land in the right arms with the rights outfits covering the right bodies. That was the case last weekend, as the WTA wrapped up its regular-season play and the ATP moved toward its World Tour Finals in London set for the middle of November. 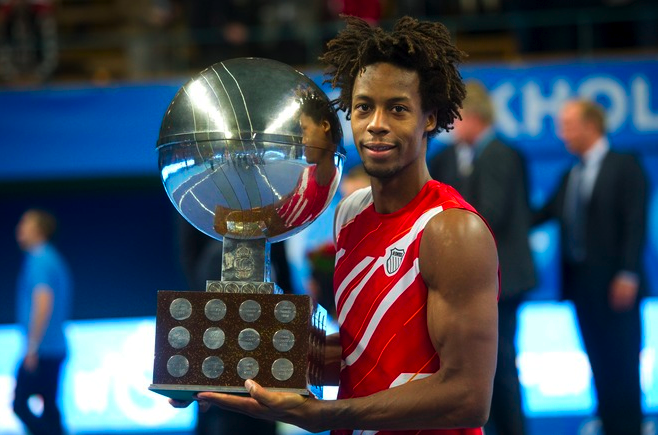 Above, Gael Monfils complemented his globe-and-box trophy with a well-chiseled bicep and a head of looks-just-right locks. He downed Jarko Nieminen in Stockholm 7-5, 3-6, 6-2. Don’t harp on Vika. Seriously. We kind of love this one, too. The half tennis racket slash harp look works well with the stone texture. And, luckily Victoria Azarenka is wearing a well-matching dark tone. It was a bright week for the world no. 3 in Luxembourg, where she took care of Monica Niculescu in straight sets, 6-2, 6-2. Vika opens her Istanbul campaign tomorrow against Sam Stosur. Double the fun. Since the US Open, Janko Tipsarevic has nabbed two ATP titles. Before it zero? Ever. 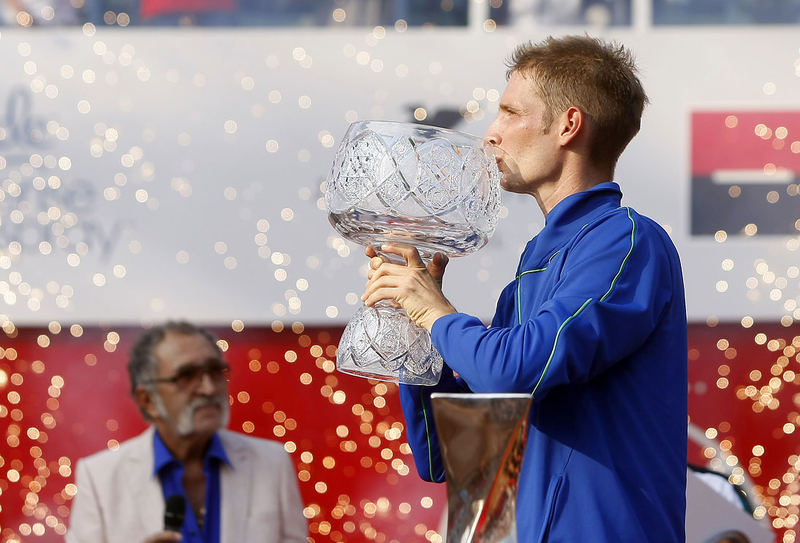 Tipsy beat Viktor Troicki in the first-ever all-Serb final in Moscow, 6-2 6-4. Must be his new bod, right? Florian Mayer got what he could fashion into a fruit bowl as a prize for his first ATP title as he beat Pablo Andujar in the Bucharest final. 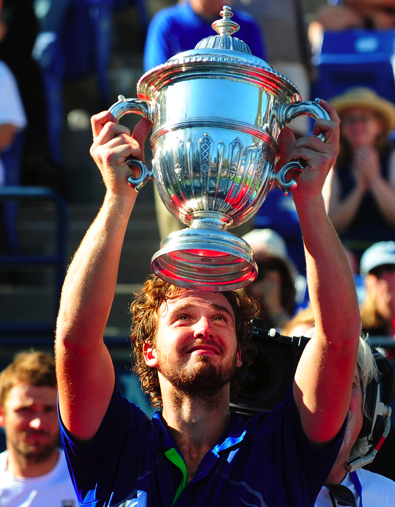 It was Mayer’s first ATP win in five final appearances. 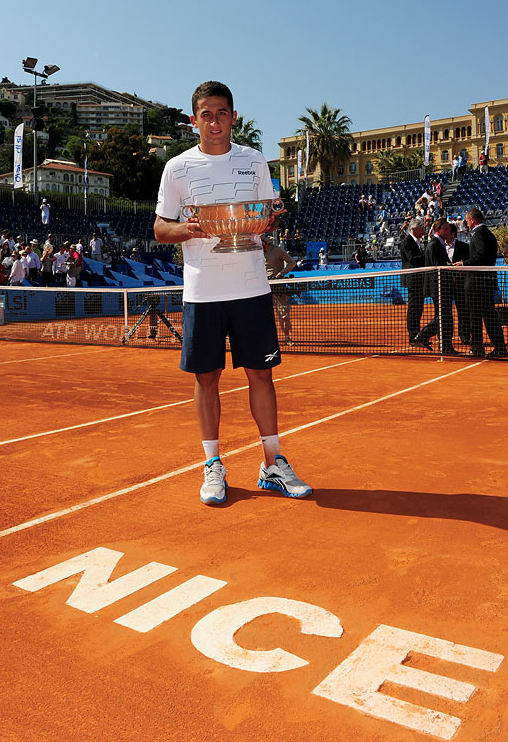 He beat the Spaniard 6-3, 6-1. 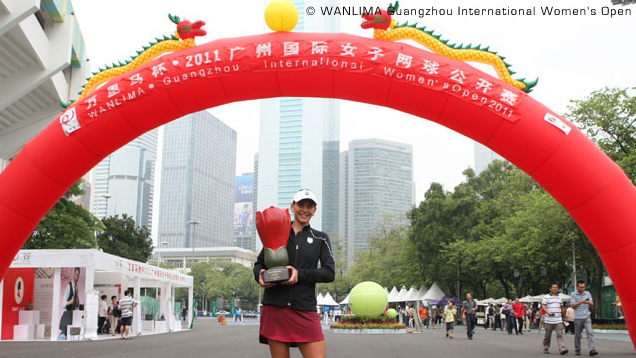 Another first timer, Chanelle Scheepers, was victorious in Guangzhou, beating Magdalena Rybarikova in the final, 6-2 6-2. 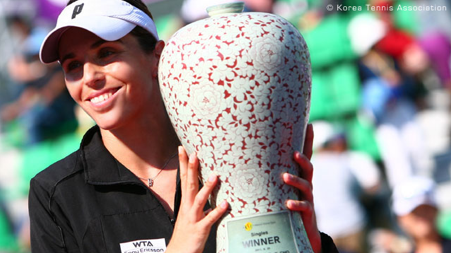 We’re really loving this classy number from the tourney in Seoul, even if the trophy does feel one size too big. Maria Jose Martinez Sanchez got past Galina Voskoboeva in the final, running away with two tie-breakers, 7-6 (0) 7-6 (2). Slam season? It’s ova! I’m out of my let’s-research-this mindset from writing for USOpen.org after two glorious weeks with a great staff at the National Tennis Center, so I’ll give someone else a go at this stat: when was the last time a Slam included no “ova” winner? Barring one-half of the girls’ doubles winning team — that’d be Irina Khromacheva — and she’s an “eva,” so does she even count? For all I know it could have been the French this year, but it certainly seems like a shocker, no?! The men’s tournament, in the end, wasn’t a shocker itself. Sure, it was shocking that Novak Djokovic for the second year in a row denied Roger Federer a shot at the title by saving match points (how ’bout that forehand?! 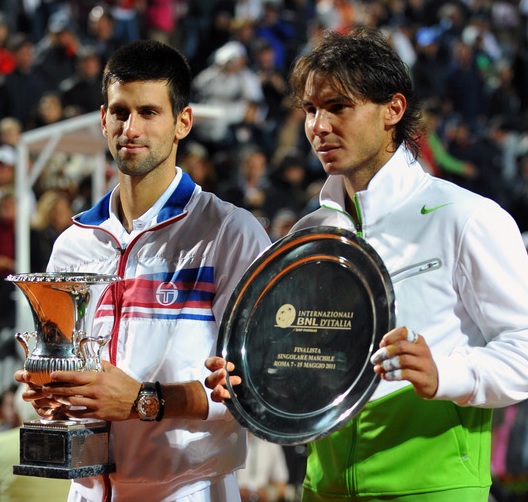 ), but in the end, it was a result that many in tennis expected: Djokovic defeats Rafael Nadal in the final. And what a final it was! Thanks for ending a semi-mediocre tournament with such a glorious match, fellas. ‘Til next time! Sam-a-Slam: Let’s just talk about the tennis. 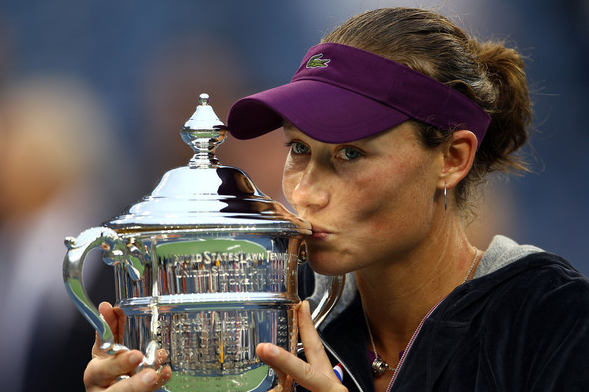 Sam Stosur played lights-out ball for two sets against Serena Williams on Sunday night at the Open. For us it was reminiscent of the way Maria Sharapova pounded her way past Serena in the 2004 Wimbledon final. Sure, Stosur’s style is completely different that Maria’s, but the result was the same: she lost just five games against her heavily-favored opponent to win her maiden major. One can only wish that the Aussie will show up with similar form at her home slam come January. Check out this Roger Federer tee being sold by Nike at their on-site U.S. Open booth. It wasn’t included in the preview they released, so I’m glad we ran across it! 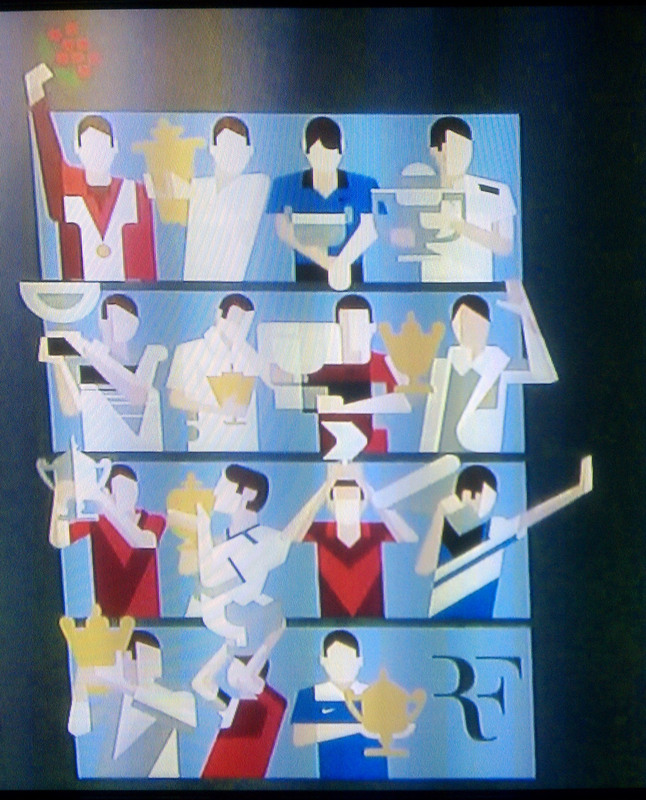 Pop quiz: The images show Roger’s medal from the Olympics (albeit in doubles) along with 14 of his majors. He has 16 Slams in total; which ones did they leave out? 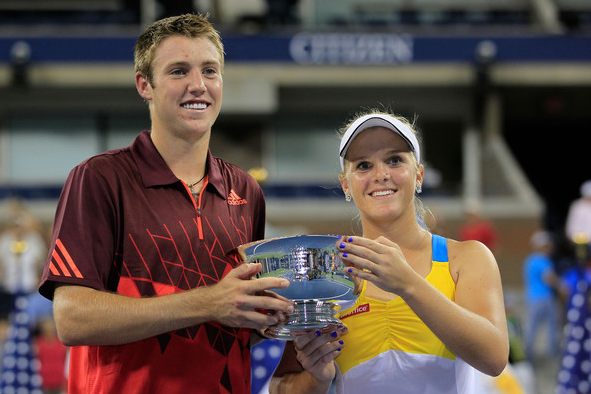 Glass happy: Before we get too deep into the US Open, let us not forget about the winners from last week: Caroline Wozniacki, John Isner and Sabine Lisicki. The trio all got awarded with glass trophies, clearly a good sign for the glass industry, no? 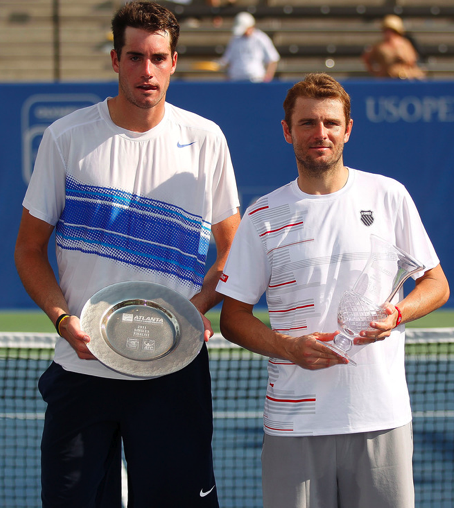 Isner followed up his semifinal win over Andy Roddick by downing Julien Benneteau in the final, 4-6 6-3 6-4. Wozniacki beat a one-Slam wonder in the semis, as well, eliminating Francesca Schiavone before beating unheralded Petra Cetkovska 6-4 6-1 in a rain-interrupted final. It was Caro’s fourth straight title in New Haven. 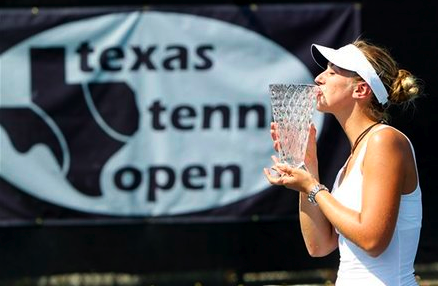 At the inaugural Texas Tennis Open in Dallas, it was Sabine Lisicki winning in fine form, beating Aravane Rezai 6-2 6-1 in the final. Has anyone else enjoyed the steady rise that Lisicki has? Now Maria and Andy can add their names (more confidently) to the list of US Open hopefuls as the year’s final major is set to start in just one week’s time. Maria’s conquering of Jelena Jankovic in Cincinnati is rather significant in the sense that Sharapova double faulted to finish out the first set. Game, set and match? Not quite. Nice to see Maria fight back to win 4-6 7-6 (3) 6-3. And — nice to see Jelena fight back herself. Just a week ago, 37% of TSF readers voted that JJ would “settle into the top 20 to 40” with the way she’s performed in the recent past. Is she herself a valid candidate for the title in Flushing? 2008 calls. And the boys, too. 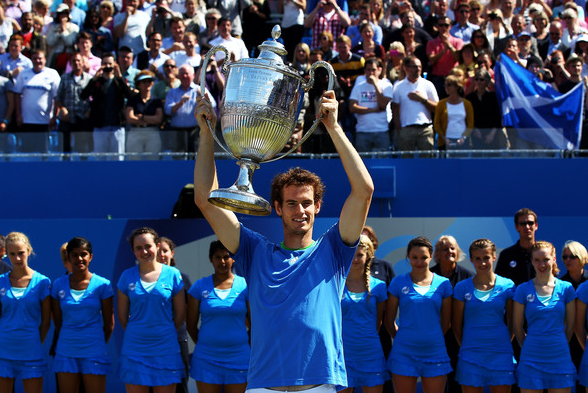 For Murray it was a great end to a rather underwhelming summer. The Scot showed us flashes of his post-Australian Open slump, including a 6-3 6-1 loss to Kevin Anderson in Montreal last week. But this week he was the man who didn’t succumb to the heat, an injury, himself or just plain, bad tennis. A recipe for success in New York City? Certainly could be. A 6-4 3-0 win over an injured Novak Djokovic (shoulder) puts Murray with Roger Federer as one of two gents to beat Djoko this year. More importantly? The top four all have legit shots to win a seventh match inside Arthur Ashe. Streak this: While Novak Djokovic may be 53-1 this year and 29-0 on hardcourts, he doesn’t have as many wins this summer as Serena Williams. Serena hasn’t lost since Wimbledon, winning her second straight US Open Series tournament in Toronto over the weekend, running through the field with a only hiccup here or there — much like she had in Standford at the Bank of the West Classic. Serena’s final triumph was over Sam Stosur, who beat Williams in the French Open quarterfinals last year in a tight affair. 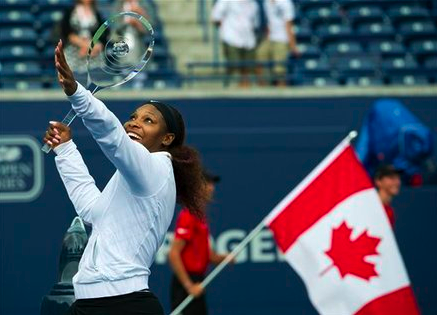 Not this time: Serena won the Rogers Cup for the second time, 6-4 6-2. King Nole: While it is clear that Serena is having a banner summer, so, too, is Nole. You just can’t take it away from him — he’s having a banner year. Prior to his final yesterday against Mardy Fish, Djoko had dropped just 20 games in four straight-set matches. Remember: this dude hadn’t played since Wimbledon! Seriously: undisputed world no. 1 on l-o-c-k. The final was a good one, thanks to a gamely Fish, who we hope will show up in similar form in two week’s time at Flushing Meadows. 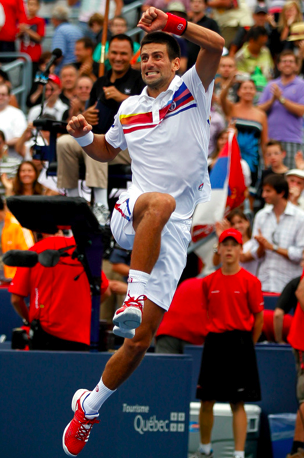 Nole, as he has 52 other times this year, emerged the winner with a 6-2 3-6 6-4 effort. Clear as day: As for the trophies, we can’t say we’re the biggest fan of the clear glass look, but if we had to choose, we’ll take Serena’s lighter, thinner option over Nole’s marginally phallic offering. But the real question? Who had the better celebration?! How are these for awkward? If last week was the week of the amazingly awkward trophies, this week it’s the humans who take their turn at awkwardness. 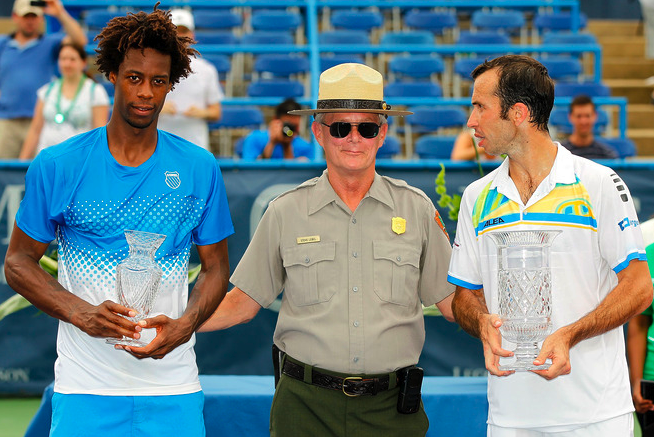 We love the trio above, as finalist Gael Monfils and winner Radek Stepanek pose with a parks official after their Legg Mason Classic title match. Stepanek upset Monfils, the top seed, 6-4 6-4. Meanwhile, below, Agnieszka Radwanska and Vera Zvonareva look o-v-e-r it in San Diego following Radwanska’s 6-3 6-4 win over Vera at the Mercury Insurance Open. Are these two friends? We can’t tell. But oy! Isn’t Aggie’s bandage an ugly sight? Back to the basics: It took this week on TSF for us to remember that Trophy Watch is just that: watching the trophies. The tour trots the globe and the globe is a creative, eccentric place. And where better does it come out than the trophies we get to see every weekend?! Sure, the clothes are great. The tournament sites are entertaining. But these trophies? There is nothing better. 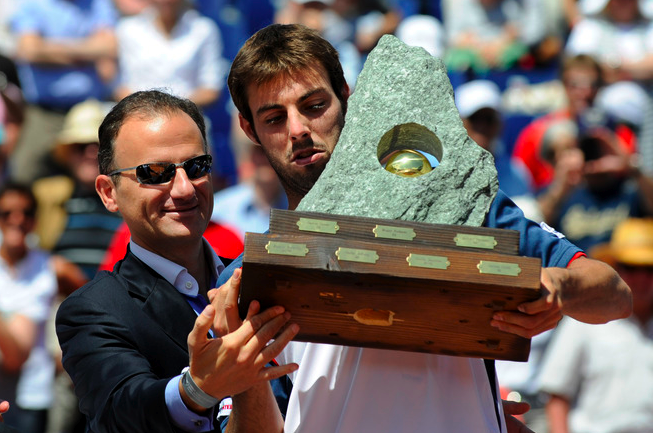 Mountain mayhem: Spanish man Marcel Granollers climbed a big one this weekend, downing Fernando Verdasco in the Swiss Open at Gstaad, 6-4 3-6 6-3 to win his second career title and first since 2008. Include us next time, please. On the creative process to come up with this gem. 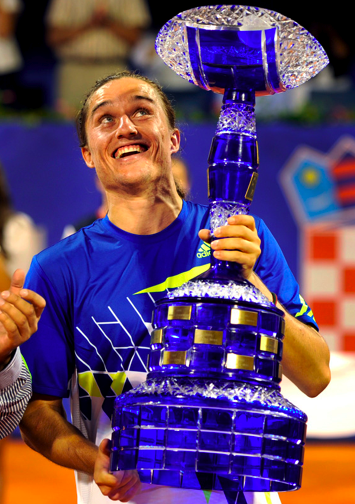 Alexandr Dolgopolov (and his head band) ruined the chances of hometown hero Marin Cilic in Umag, Croatia. Dolgopolov won 6-4 3-6 6-3. Smile, Mr. Bear. 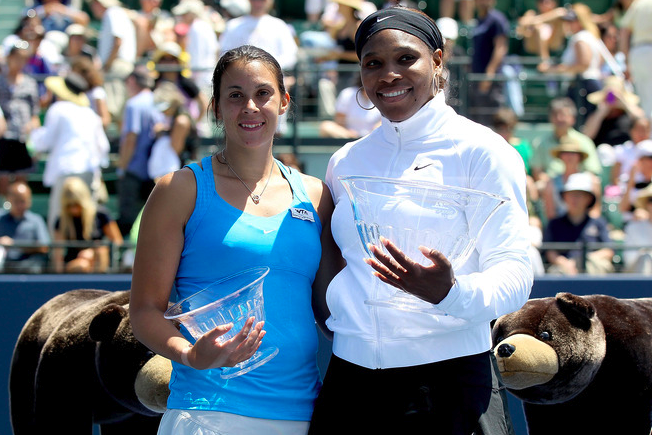 Serena Williams and Marion Bartoli were smiling just fine for the camera, though that brown bear on the right looks rather bummed out that he, too, wasn’t awarded a crystal bowl. Next time, fuzzy buddy! 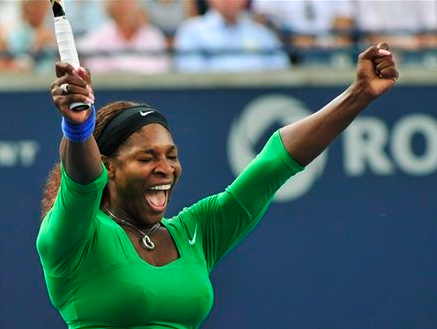 Serena tore through the field at Stanford, beating Bartoli 7-5, 6-1 in the final. Two straight for Fishy: Mardy Fish denied John Isner from pulling a Mardy Fish yesterday in Atlanta. 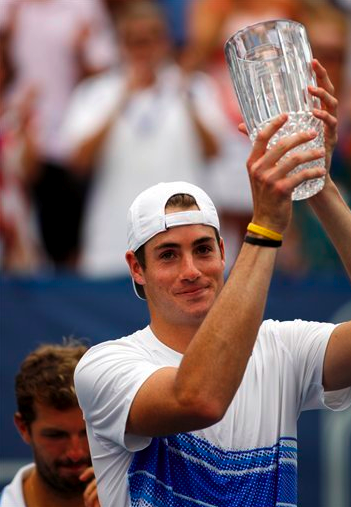 Last year, Fish had won Newport and Atlanta to kick off a hot summer, and with Isner taking the North American grass court tourney this year, he was trying to pull a Fish and double dip to start his own US Open campaign. But Fish, the no. 9-ranked player in the world, fended off Isner in Atlanta at the Atlanta Tennis Championships, beating his countryman 3-6 7-6 (6) 6-2. John doesn’t look too happy now, does he? The reason? It was the second straight year Fish had beaten Isner in the final here, saving match points this time around to take a cup over a platter (better to drink out of!). There’s still a few weeks before the big show in NYC! Cheer up, Johnny boy! Vera, unplugged. 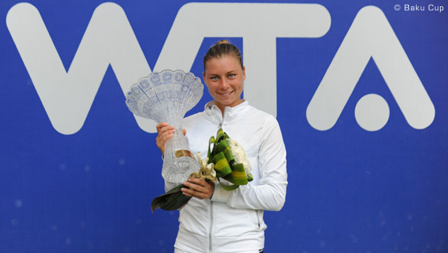 It was the turnaround that Vera Zvonareva was in desperate need of. The Russian had struggled through Europe, whimpering out of Wimbledon where she so forcefully made the final last year, losing out to Tsvetana Pironkova in the third round, 6-3 6-2. But Anastasia Pavlyuchenkova, Vera’s countrywoman, made the biggest Baku headlines for the week for her 25-double fault match that she WON. More importantly? Vera was the week’s winner. Zvonareva took down the tough Anna Tatishvili, 7-5 6-7 (4) 6-2. Gilles, too. 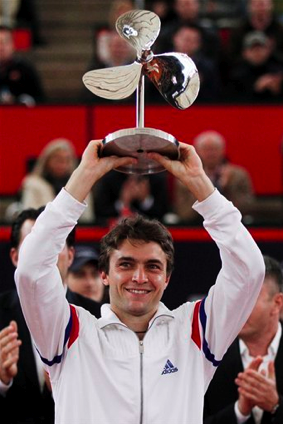 Meanwhile, on clay, Gilles Simon took Nicolas Almagro to task, winning in Hamburg, 6-4 4-6 6-4. Is that a Robin in there? 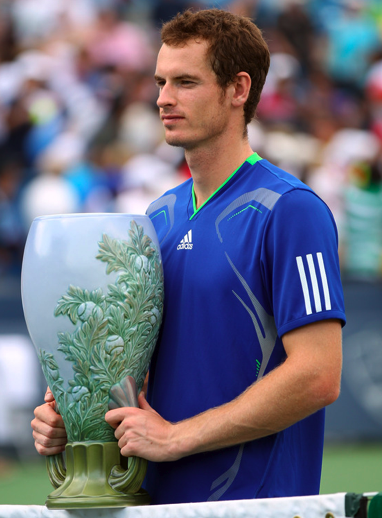 No but really: there’s a bird in his trophy. 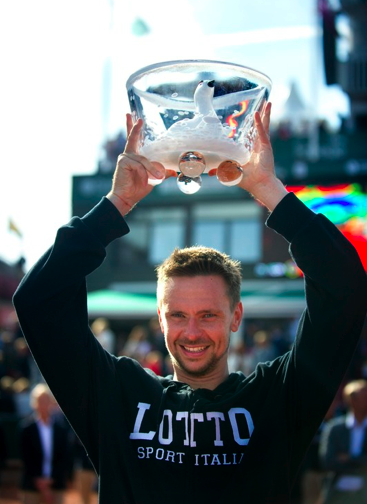 Swedish fella Robin Soderling played hometown hero yesterday when he fought his was past a tough David Ferrer 6-2 6-2 at the Swedish Open in Bastad. 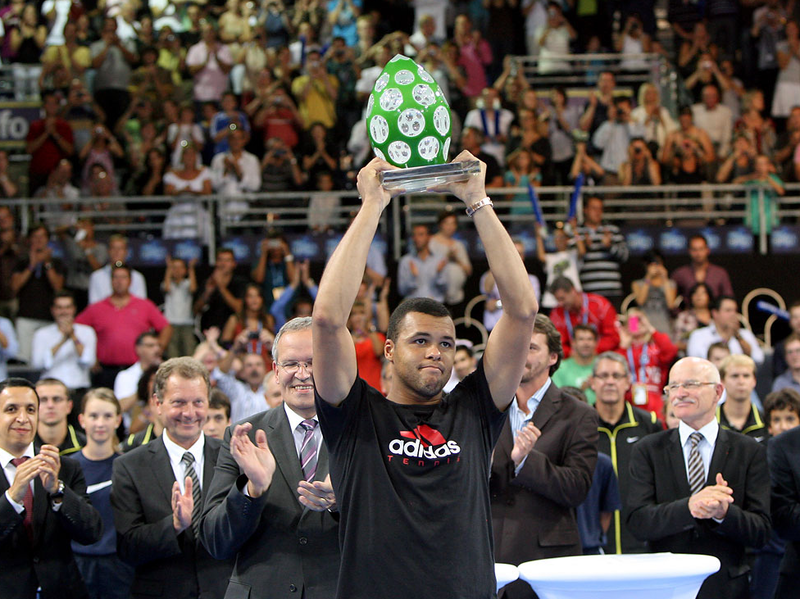 It was Soderling’s second title in three years in front of a home crowd, winning his fourth tour tournament of 2011. Soderling improved to an impressive 10-4 against Ferrer. Furry fury. 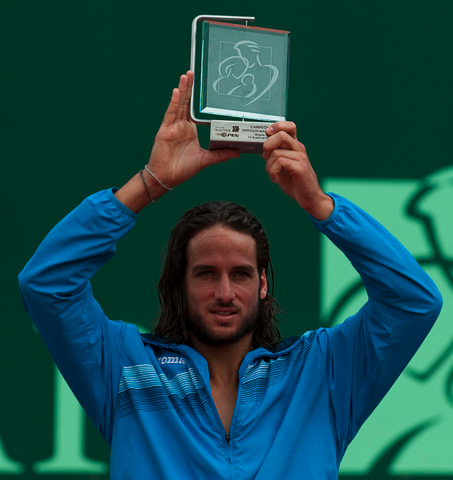 We guess Feliciano Lopez wanted to just head to the Colombian mountains, grow a little beard and unzip his JOma jacket — ahhh, the life! But FiLo played some tennis, winning in Bogota over Colombian Carlos Salamanca 6-4 6-3 at the Seguros Bolivar Open. That’s really her trophy. Remember that Andy Roddick commercial where he buys two tickets for the return flight? (Note: He doesn’t have to do that much these days.) This picture reminds us of said commercial. Here the folks in Bad Gastein, Austria, must have been upset that Maria Jose Sanchez Martinez took out their home girl Patricia Mayr in the final (6-0 7-5) so they gave her this giant, ridiculous trophy to PUNISH her. We think it may have worked. No Wimbledon hangovers here: For those players who choose to play the week after Wimbledon on the tours, they never know quite what they’re getting themselves into until they get onto the court and realize, Hey, this isn’t Wimbledon! For the men the surface transition might be a little easier (the only event offered is a grass court tune-down — is that what you call a surface-specific post-Slam small event? ), though they go further geographically, crossing the Atlantic while the women stay in Europe (Sweden and Hungary, respectively). 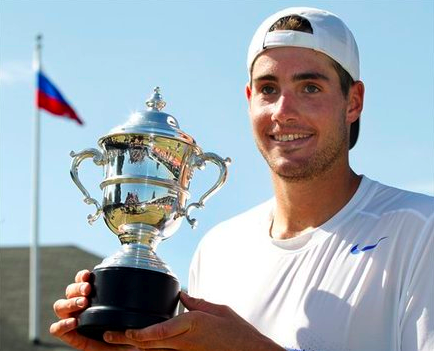 Newport: While John Isner was left off the losing US Davis Cup team, the 6-foot-9 big-serving American took a wild card into the Campbell’s International Tennis Hall of Fame Championships and won the tourney, the first top seed to do so in its 35-year history. And while he stood much taller than 5-foot-6 Olivier Rochus, the 26-year-old barely inched past the Belgian, 6-3 7-6 (6). The 15-inch difference between the two players was the greatest in ATP history. Clay ladies: Polona Hercog and Roberta Vinci were happy to be back on the red stuff, winning titles in Bastad and Budapest, respectively. Hercog nabbed her first WTA win with help of an injured Caroline Wozniacki (who withdrew in the second round), beating local Johanna Larsson in the final, 6-4 7-5. 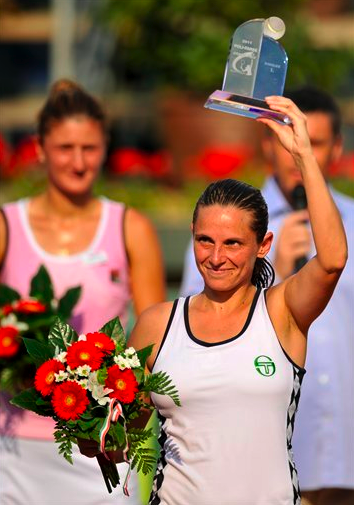 Vinci, meanwhile, captured her third title of the year, defeating Irina-Camelia Begu, 6-4 1-6 6-4. See Vinci below. Different paths, same result: The lead-ups to their respective Wimbledon titles could not have been more different, but it was Petra Kvitova and Novak Djokovic who were at the Champions’ Ball on Sunday night, each posing with their respective, hard-earned trophies. Kvitova’s 6-4 6-3 victory over Maria Sharapova shocked us a bit — at least in the ease that she saw it through — and the way she took it all in stride (no on-court breakdown, P?!) after winning. For Djokovic, his 6-4 6-1 1-6 6-3 win over Rafael Nadal was the Spaniard’s first loss to someone other than Roger Federer in a Grand Slam final. 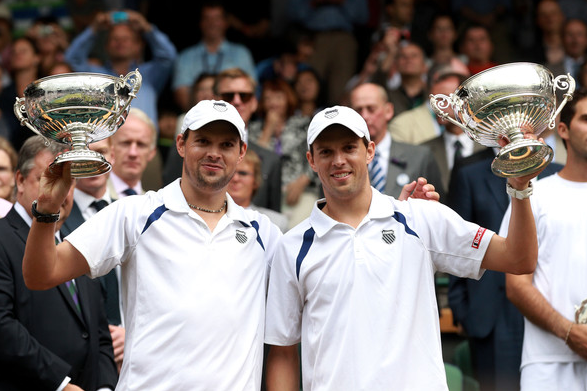 Below, a look at all the Wimbledon champs from the Bryan brothers’ historic doubles victory to the winning juniors. Above: We are digging Kvitova’s toned-down side bun and simple, but gorgeous manicure. A classy champ! Us, too! It was a monstrous week for Bob and Mike Bryan, who won their third round match 16-14 in the fifth set and semifinal match 9-7 in the fifth set before comfortably rolling in the final, 6-3 6-4 7-6 (2) over Robert Lindstedt of Sweden and Horia Tecau of Romania. 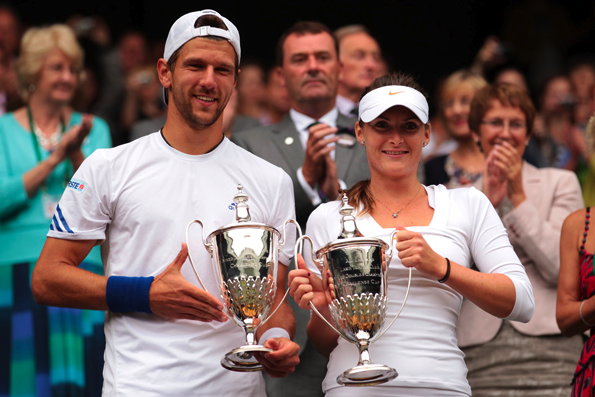 Their win in London was their 11th Major title, which ties them with Aussie duo Mark Woodforde and Todd Woodbridge for most Grand Slams by a doubles pairing. 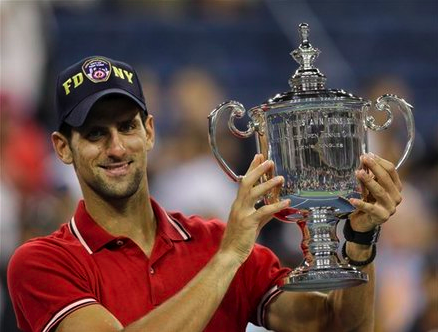 Not just you, Novak: Djokovic became the world’s no. 1 player in yesterday’s rankings with his win at the All England Club, but so, too, did Kveta Peschke and Katarina Srebotnik, who took the ladies’ doubles crown. Peschke and Srebotnik subdued Sam Stosur and Sabine Lisicki 6-3 6-1 for the title. Me, too. 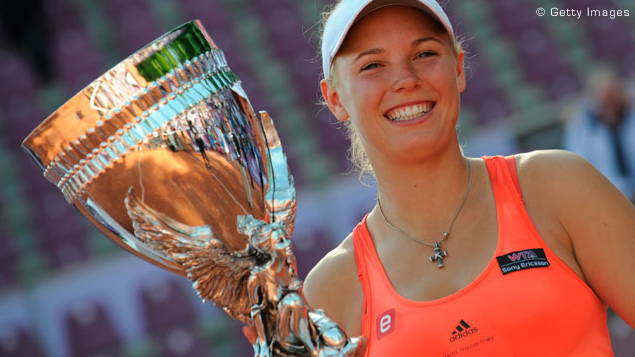 Caroline Wozniacki showed that Murray wasn’t the only one who could win in front of a home crowd. 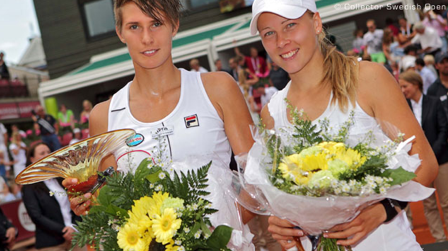 The Dane won the e-Boks Copenhagen Open in a decidedly easy draw, beating Lucie Safarova, 6-1 6-4 in the final. Third time’s a charm. Philipp Kohlschreiber wasn’t about to be left out of the home-country equation, either. The German 27-year-old won an all-German final when countryman Philipp Petzschner retired during their match with a lower back injury. It was the world no. 49’s third career title and second on home soil. Kohlschreiber led 7-6 (5) 2-0 when Petzschner called it quits. Short(er) balls: With Wimbledon right around the corner, we figured there were too many good tennis-y items out there to pass up. Here’s a few we scooped together earlier today. | The first — it would happen — is a golf item. With the US Open underway today, this hilarious vid of four pro golfers doing their best boy band impersonation has gone viral. And for good reason. | Wimbledon qualies are underway (Men | Women). Some notable notes: American Ryan Harrison is the last Yank standing. The no. 14 seed has made another good showing in the lower ranks. He has one more match to win to get in. As do Americans Alexa Glatch, Irina Falconi and veteran Lindsay Lee-Waters. Bernard Tomic is in the final round of the men’s as well, as is former main draw quarterfinalist Tamarine Tanasugarn on the ladies’ side. Glatch took out Caroline Garcia — of almost-beating Sharapova fame — 6-1, 6-0 in the second round. And disappointedly, Slovak Lenka Wienerova lost out in the first round. | The Guardian has this great look at tennis fashion through the years. | Missed Billie Jean King on the Today show this morning? Watch her appearance here. The King and Queen of Clay: Between Rafael Nadal and Li Na, the Na’s had it over the weekend in Paris. It was a tremendous finish to a grand clay-court major, Na coming out on top of what some called a depleted field but one that saw four semifinalist who could have all easily claimed their last two matches in straight sets and everyone would have said, Yeah, we guess that makes sense. It did make sense for Na, who fought off a poor-serving Maria Sharapova in the semifinals and then just barely rose above the defending champ, Francesca Schiavone, to win in China’s first singles Major. As for Rafa, he fought off all the usuals: Andy Murray and Roger Federer at the end. He also fought off a testy first week, a doubting press (and a doubting self) and the streak of Novak Djokovic (thanks to Rog). Nadal now has ten Slams to his name, creeping into the double digits along with Federer. Whichever the two of them end up with more is yet to be seen (for years), but Nadal equaled Bjorn Borg‘s record of six Roland Garros trophies. Kudos, kid. A (now) familiar picture: Who could have guessed that this is how the men’s pro tennis book would have been written so far this year? Novak Djokovic is an unprecedented 37-0 going into Roland Garros, now having beaten Rafael Nadal in four straight Masters Series finals, two of them on Rafa’s beloved clay. Djokovic’s 6-4 6-4 win in Rome on Sunday sent out another warning cry to the rest of the tour: watch out, boys. It’s beginning to feel good to be Maria: Could the Russian be headed for the Sharapova Slam? Maria won her 23rd career title on Sunday, capping a big week in Rome with a 6-2 6-4 win over Sam Stosur. Next up for Maria: a title in Paris? She holds three majors and now has a legit shot to nab a fourth in three week’s time at Roland Garros. Two more shots of the title-winners after the cut. Before we step away from the men, this between-the-legs lob winner from Rafa might be one of the best shots you’ve ever seen. We’re serious. Click. Play. Bracing for a win. 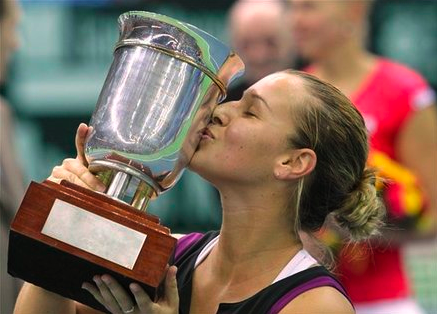 This isn’t the first time we’ve seen a big winner sporting some metal on her teeth on the WTA. Great to see Petra Kvitova, the Czech who had a phenomenal 2010, rise above the rest in Madrid. 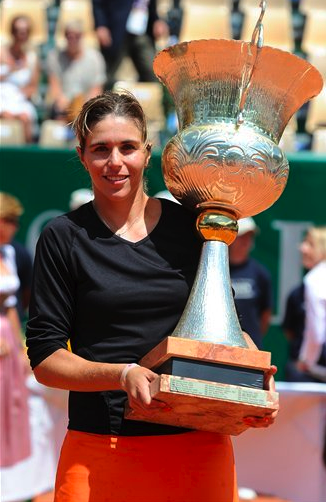 Will she be the Aravane Rezai of 2010 and slump for the rest of the season? We hope not. Here, she smiles after a 7-6 (3), 6-4 win over Victoria Azarenka. 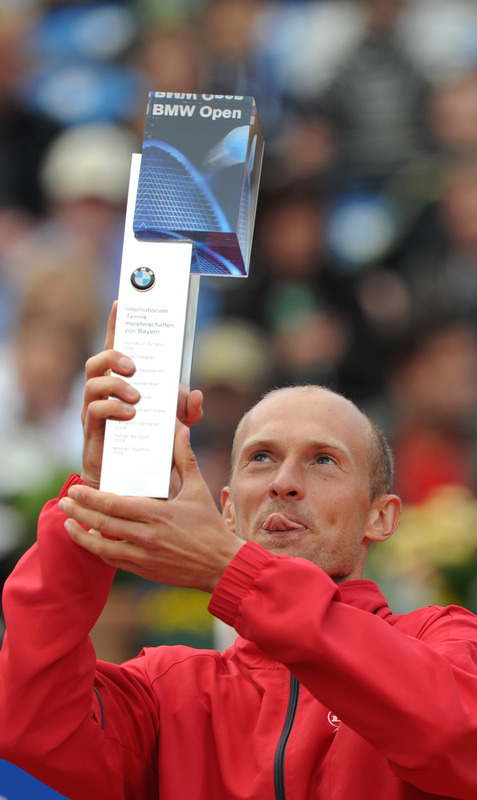 We know he got his own post-win post (and a Trophy Watch mention), but it couldn’t hurt to put up a pic of Kolya actually hoisting his BMW Open trophy for, yknow, posterity’s sake. TSF hasn’t seen him smile like this in a while. For your vest interest: We were all set and ready to make a trophy-bearing Nole, now 27-0 this season, our lead picture on this week’s Trophy Watch. That was until we saw this gem of a photograph with Arantxa Sanchez-Vicario with Barcelona doubles winners Iveta Benesova and Barbara Zahlova Strycova. We want, Arantxa! 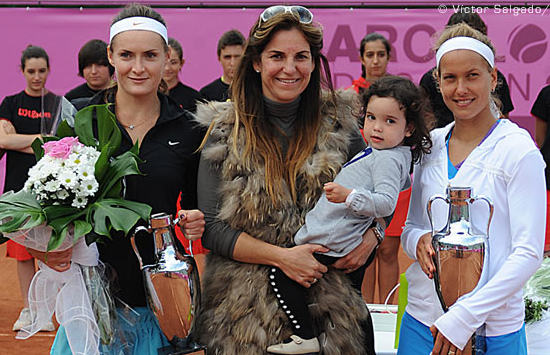 She’s holding her 2-year-old daughter … Arantxa. Now that we know you wear fur and have named your child after yourself, we must come to Barcelona and sip champagne with you, ASV. Loves it! 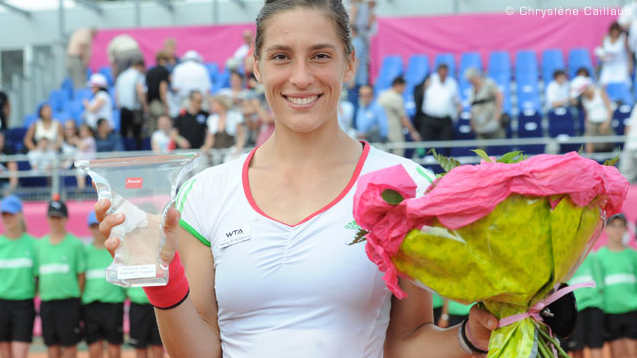 Oh right, and Roberta Vinci won the singles crown. See her boring troph(ies) here. 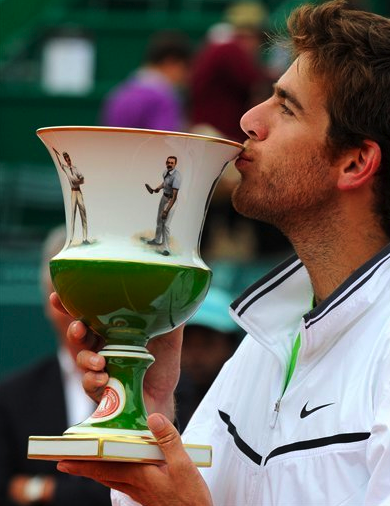 Kissing the fellas: How about that artwork on Juan Martin del Potro‘s Estoril trophy? We sure dig it. The painted (porcelain?) cup is what we’d sip our champagne out of while hanging out with a fur-wearing Arantxa in Barcelona. JMdP overwhelmed Fernando Verdaso 6-2, 6-2 in the men’s final. No one but Nole: While Novak won his home event for the second time in three years, he was aided by Janko Tipsarevic, a valid challenger who had to skip out of their SF match up because of injury. In the final, Djoko took down Feliciano Lopez 7-6 (4), 6-2.